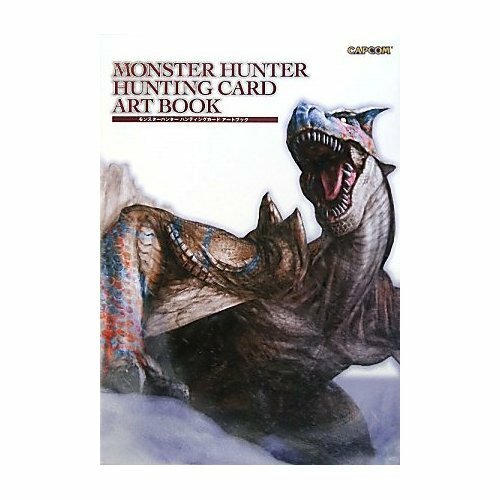 Here's the art book for the Monster Hunter Hunting Card game. I'm not familiar with the card game but it seems like the chapters are organised by the card series (or not), namely Shadows in the ocean of tree, Strong man's bonds, Emperor of roaring flames and Golden anger. Since it's featuring art from cards, the illustrations are all in square format. The dragon, monster and hunter designs are really wild and varied. There are plenty of fantastic creature designs by numerous artists. The designs for the hunters are unbelievable, in the literal sense. While they are really cool, it's hard to imagine human figures actually capable of wearing thick armour, carrying heavy weapons and still be able to fight dragons at the same time. However, the designs are really intricate and wonderful to look at. I guess the main thing is they look fun. Nice book if you just want to collect the art and not the cards. If you like Monster Hunter, you should also check out モンスターハンターイラストレーションズ (Monster Hunter Illustrations) and モンスターハンターCGアートワークス (Monster Hunter CG Artworks).